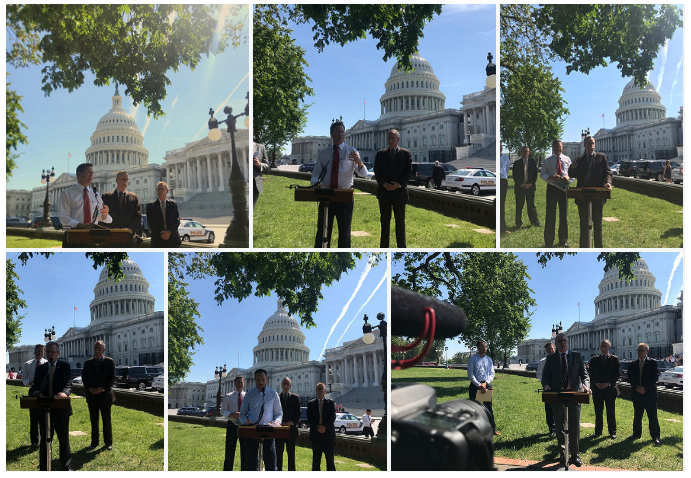 WASHINGTON, DC – (RealEstateRama) — Co-Chairs of the Congressional Building Trades Caucus, Congressmen Donald Norcross (D-NJ) and David McKinley (R-WV), along with the Construction Employers of America, commemorated Infrastructure Week 2017 and called for robust infrastructure investments at a press conference on Captiol Hill. According to a study by Professor Stephen Fuller at George Mason University, an additional $1 billion invested in nonresidential construction would add $3.4 billion to our gross domestic product, $1.1 billion to personal earnings, and create or sustain 28,500 jobs. The Administration’s stated promise to secure $1 trillion in infrastructure investment would invigorate our economy and produce long-term job growth across the country. The policymakers and CEA members are advocating key provisions be included in federal infrastructure legislation, including retaining voluntary use of Project Labor Agreements and maintaining and strengthening regional prevailing wage (Davis-Bacon) requirements. In March 2016, Rep. Norcross, an electrician by trade, joined with Rep. David B. McKinley, who worked and taught in the construction industry, to launch the Congressional Building Trades Caucus. The bipartisan effort brings together Members of Congress from both sides of aisle to discuss issues that affect the millions of men and women who work in the construction industry.